Jasper National Park in Alberta, Canada is without doubt one of the most impressive locations in the world for capturing dramatic landscape images. Things are just…. BIG! It’s as if he word ‘epic’ was created to describe Jasper National Park and the Canadian Rockies in general. 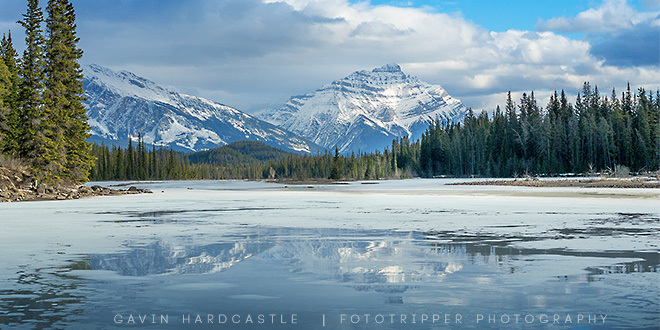 Let me share my Jasper National Park photo tips with you. Avoid the summer if you prefer not to deal with bus loads of tourists. Yes it’s the warmest time of year but the days are long, the prices are inflated and the crowds are intolerable. Expect line ups for everything. If you plan on visiting remote locations like the Tonquin Valley, you’ll have less issues with crowds but for the more easily accessible and popular spots, expect carnage. Besides, if you go in summer you’ll miss scenes like this. Late morning at the Athabasca River in March during the thaw. This is about 30 minutes South of Jasper. September is when things start to calm down and the crowds are manageable. There’s still plenty of wildlife on show and all of the popular locations are still accessible. There’s also a chance of fall colours and the occasional dusting of snow to dress the mountaintops. Perfect for us photographers. October is when the fall colours hit their peak and the prices of accommodation go down. There will be less tourists but expect a lot of serious photographers to be hanging around during golden hour. November is when you’ll find stunning ice formations starting to form and if you get interesting weather you’ll get those classic ‘fire and ice’ shots. Places like Spirit Island will no longer be accessible by water. Late afternoon. This is the view to the South as you cross the Athabasca River into Jasper. Winter is in full swing, lake beds are covered in a boring sheet of white and you’ll want to make avoiding frost bite your main priority if you plan on spending hours outside shooting. On the plus side, the days are super short, the air is clear and crisp and there are zero crowds to contend with. It’s a perfect time of year to shoot the stars at night and still be home early enough for dinner. This is an excellent time to capture the start of the winter thaw. 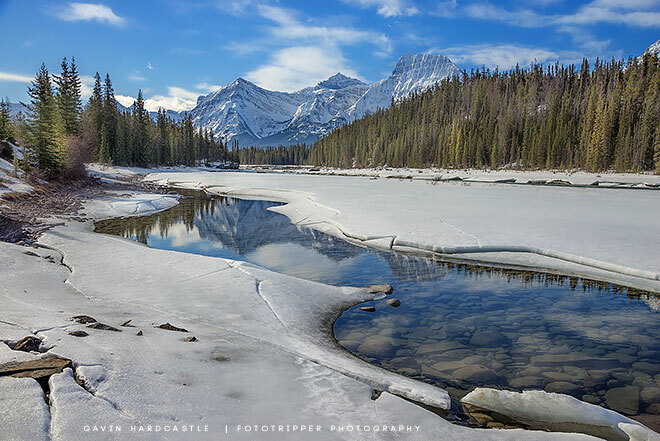 The Athabasca river starts to open up a little and the melting ice forms hypnotic shapes that offer perfect foregrounds. Prices are more affordable and although not all locations are easily accessible, there are still endless photo opportunities within the park. That being said, this is the Canadian Rockies we’re talking about. You can’t be sure what the weather will do so expect anything. Inside the heart of Maligne Canyon during March. Ice cleats are essential. The thaw is in full swing and prices begin to creep up as the crowds coalesce. You still can’t canoe or boat to Spirit Island. That happens between June and October. If you absolutely have no other choice, go in the summer. If you do have a choice, go at any other time so that you have a much better photography experience. Most visitors reach Jasper by driving North from Banff. This is an amazing drive any time of year but the killer compositions start revealing themselves once you reach the Athabasca Valley and continue North to Jasper. It really is just a case of driving along the highway and stopping all the time to photograph amazing scenes. There are plenty of pullouts and places to stop when you see something worthy of getting the tripod out. Here are some of my favourite locations. Just 15 minutes South of Jasper you’ll hit the bridge that crosses the Athabasca River. Park up in the pullout and venture down to the water for endless photo ops of Pyramid Mountain reflected in the river to the North. This is a great location for both sunset and sunrise as Pyramid Mountain catches side light from East and West. Looking North across the Athabasca River towards Pyramid Mountain. This spot is just below the bridge into Jasper. 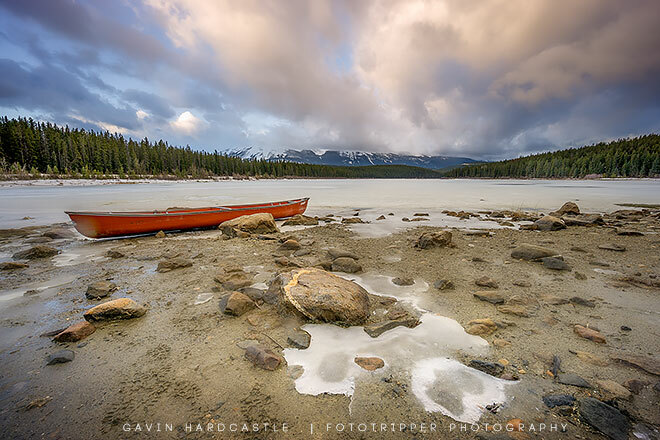 You can usually count on a few canoes to be lying around for some foreground interest. 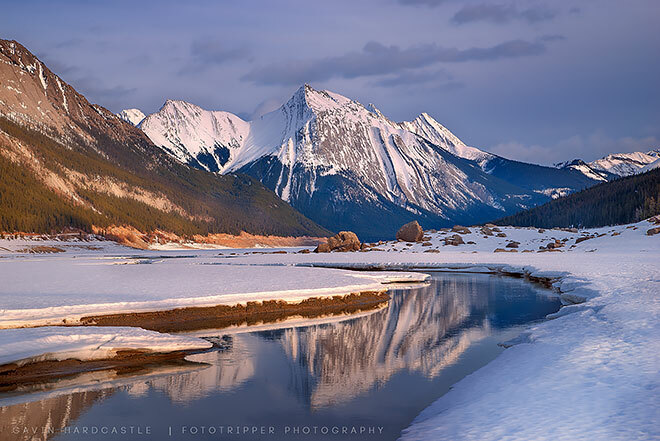 If you’re shooting in the warm months try and catch some nice mountain reflections. 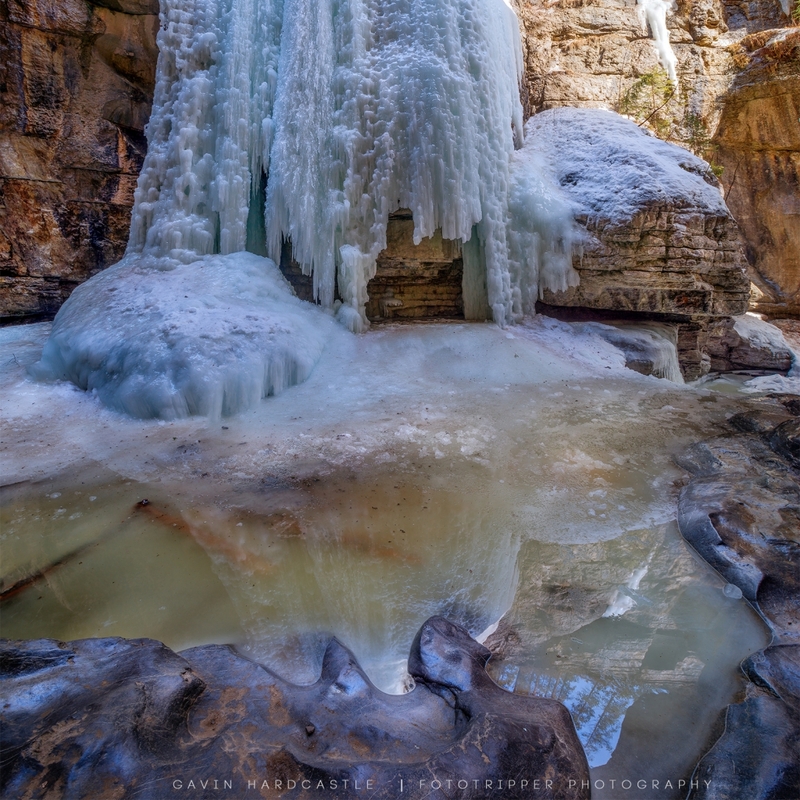 If you’re shooting during the freezing months try and pick some interesting ice or melt formations. 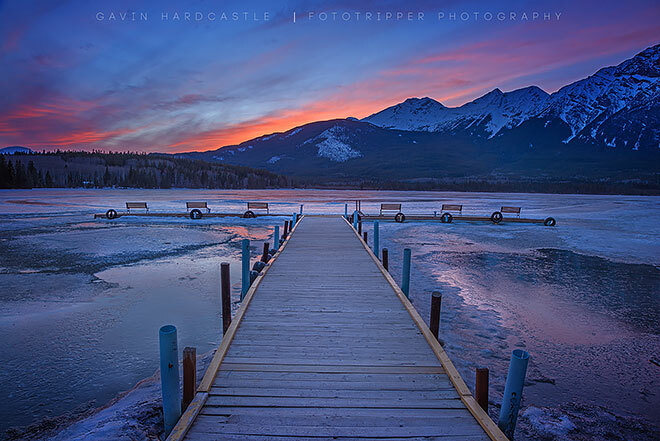 Patricia Lake sits right next to Pyramid Lake and they are both about a 5 minute drive from Jasper village. This is another spot that works well for both sunrise and sunset. Early morning sunrise facing West to catch the glow from the East. That huge mountain that you see as you look North across the bridge over the Athabasca River is called ‘Pyramid Mountain’ and would you believe there’s a lake at the very foot of it. Perfect for photographers looking for gorgeous reflections or interesting ice shapes. Sunrise and sunset are ideal times for beautiful afterglow in the clouds. Afterglow in the clouds from the setting sun during March. Pyramid Lake is a dark sky area, so if you get a clear and moonless night you’ve got a strong chance of shooting some stunning milky way shots or star trails. As I mentioned earlier, it’s just a short drive from the main street of Jasper Village and you have to pass Patricia Lake first. Prepare to be awed by the amazing power of mother nature. 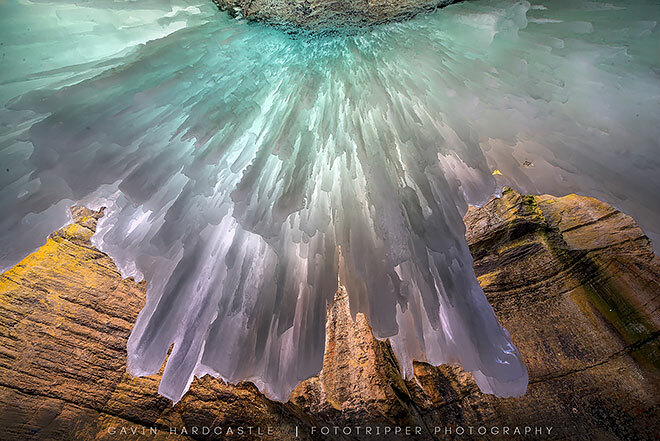 During the winter, the river freezes completely, forming massive ice chandeliers and towering ice sculptures. Make no mistake, it can be dangerous and you will absolutely need a good pair of ice cleats on your hiking boots. Maligne Canyon is a 10 minute drive North, West of Jasper village. Head along Maligne Road and about 15 minutes passed Maligne Canyon you’ll enter a valley that’s home to Medicine Lake which is actually not a lake. November and March will give you more interesting conditions as you hunt for the best mountain reflections amid fascinating ice formed shapes. This was shot during sunset using the Canon 24-105mm lens. Stunning at any time of year, Athabasca Falls is close to the highway and offers close up views of the Athabasca River as it plummets through a gorge to carve out intricate shapes and potholes. Overcast days give softer light but sunny days will make the water colour pop. Polarizer – For control of blown out clouds and colour saturation. Don’t forget to disengage the polarizer for that second exposure that captures maximum reflection in lakes and rivers. Tripod – Bring a weight bag in case it gets windy- and it does. Zoom lens and something above 50mm to get you close to faraway mountains. Headlamp if you plan on shooting at night which I recommend. Ice Cleats if you plan on visiting during winter. These are essential. 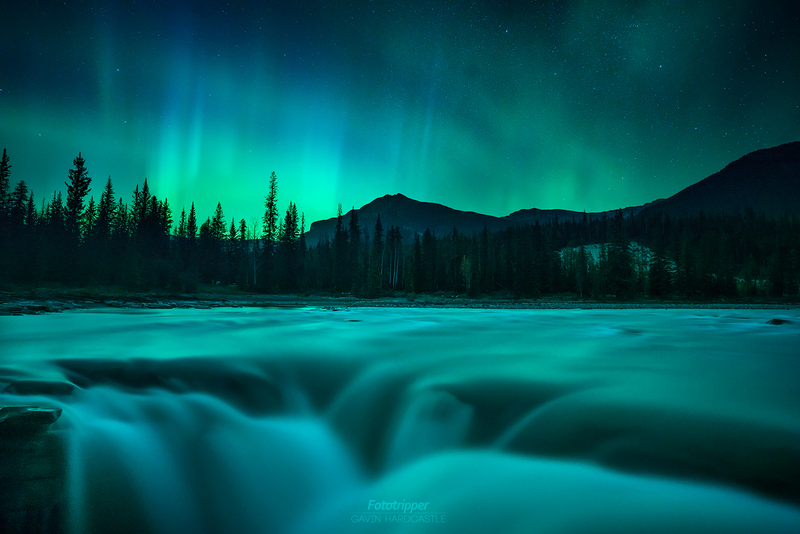 This article gives you just a glimpse of the photographic potential to be found in Jasper National Park. Over time I’ll add more pictures and locations to keep this post current. 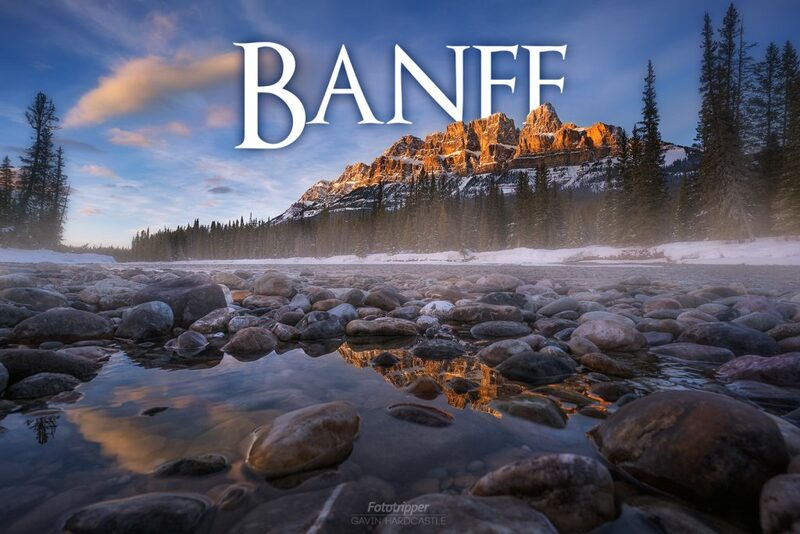 If you fancy the idea of shooting with me in the Canadian Rockies, please check out my Banff Photography Workshop – Winter and my Banff Photography Workshop – Fall Edition. 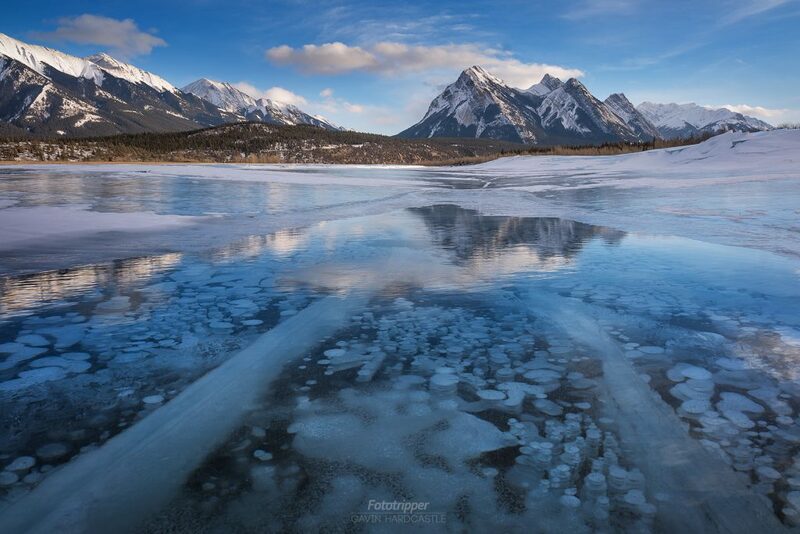 Without doubt, one of the best locations in the Canadian Rockies in Abraham Lake wit hits famous ice bubbles and epic ice cracks. 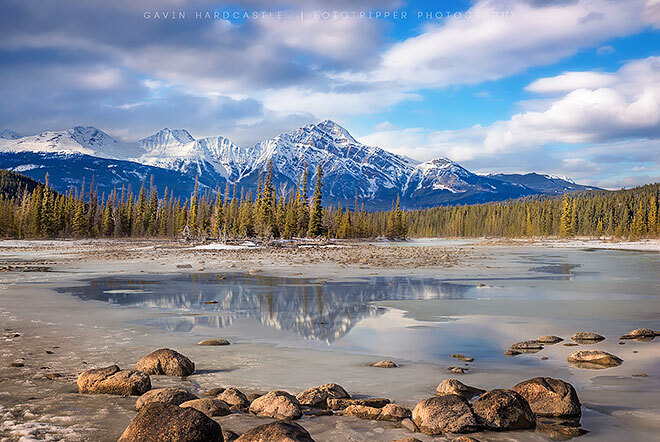 Lucky for you I put together a free Abraham Lake Photography Tips blog to help you get the most out of your visit. You’ve also got a good chance of seeing some impressive wild Elk in and around the town of Jasper so be on the lookout for those. I’ve seen people walk right up to them and snap away and the Elk are just happy to keep on munching grass. It’s tempting but please don’t feed any wildlife. This is especially important for predators like bears. If a bear gets too accustomed to humans because of tourists giving them food, it usually ends badly for the poor bear. As I mentioned earlier, Jasper can be outrageously expensive during high tourist season, after all this is Canada. I’ve spoken with Hotel staff who warn that prices can easily triple during peak season so I would always advise visiting in the shoulder seasons or winter. I found the accommodation at the Sawridge Inn to be very good during March but I’d begrudge paying triple for the crime of visiting in the summer. I had some OK meals in Jasper. Cassio’s Italian Restaurant does a good salad and they swear their pizza and pasta is awesome. I also dined at Kimchi Korean restaurant and while the soup I had was good, I had to wait a full 20 minutes for it to cool down to just simply piping hot. Not sure why they cook it to the surface temperature of the sun but next time I’ll order something I can eat when it arrives. As with Banff, prepare yourself to shell out around $20 per meal and $7 per pint. The Canadian Rockies ain’t cheap. If you know of any amazing locations that are perhaps lesser known, please leave a comment along with any other tips that readers might find helpful. Your website is awesome. I’ve been traveling all summer and photographing and having your site as a reference has helped a ton! Your work is phenomenal and I hope I can learn more from you. I would love to hear what you think about my work as well. Thanks again for every post! I’m currently working/living in Jasper and I can only agree that it is an amazing place with beautiful landscapes. I hope to find some great spots for sunrise & sunsets pics. Thank you so much for this overview. It has been the most helpful! I am planning a trip in early November to Banff and Jasper. Did you mean Elk instead of Caribou in and around Jasper? I think you’re right Darcy. Fixing now.